The menus hang from the ceiling on small cards. They serve great tapas / hors d’oeuvres. This is a small standing only bar. Wine starts at around 6 Euros and small plates around 3 Euros. The salmon was fantastic. It is also a place that serves great French macaroons. Can it get any better? Wine, Tapes and macaroons. C’est la vie! 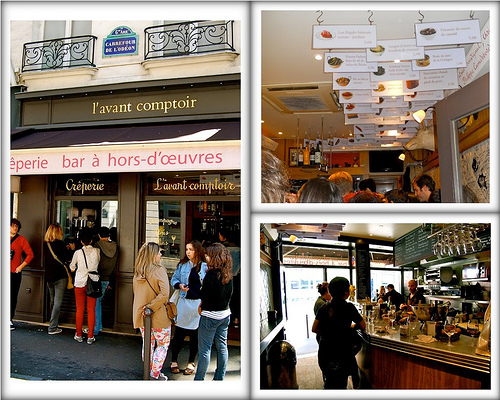 Paris has many things to sample in terms of wine and drink. The Top Ten Foods You Have To eat in Paris. This article lists 10 do not misses including my favorite wine bar above.